NEW YORK – Seven years after the global financial crisis erupted in 2008, the world economy continued to stumble in 2015. According to the United Nations’ report World Economic Situation and Prospects 2016, the average growth rate in developed economies has declined by more than 54% since the crisis. An estimated 44 million people are unemployed in developed countries, about 12 million more than in 2007, while inflation has reached its lowest level since the crisis. More worryingly, advanced countries’ growth rates have also become more volatile. This is surprising, because, as developed economies with fully open capital accounts, they should have benefited from the free flow of capital and international risk sharing – and thus experienced little macroeconomic volatility. Furthermore, social transfers, including unemployment benefits, should have allowed households to stabilize their consumption. But the dominant policies during the post-crisis period – fiscal retrenchment and quantitative easing (QE) by major central banks – have offered little support to stimulate household consumption, investment, and growth. On the contrary, they have tended to make matters worse. In the US, quantitative easing did not boost consumption and investment partly because most of the additional liquidity returned to central banks’ coffers in the form of excess reserves. The Financial Services Regulatory Relief Act of 2006, which authorized the Federal Reserve to pay interest on required and excess reserves, thus undermined the key objective of QE. Indeed, with the US financial sector on the brink of collapse, the Emergency Economic Stabilization Act of 2008 moved up the effective date for offering interest on reserves by three years, to October 1, 2008. As a result, excess reserves held at the Fed soared, from an average of $200 billion during 2000-2008 to $1.6 trillion during 2009-2015. Financial institutions chose to keep their money with the Fed instead of lending to the real economy, earning nearly $30 billion – completely risk-free – during the last five years. This amounts to a generous – and largely hidden – subsidy from the Fed to the financial sector. And, as a consequence of the Fed’s interest-rate hike last month, the subsidy will increase by $13 billion this year. Perverse incentives are only one reason that many of the hoped-for benefits of low interest rates did not materialize. Given that QE managed to sustain near-zero interest rates for almost seven years, it should have encouraged governments in developed countries to borrow and invest in infrastructure, education, and social sectors. Increasing social transfers during the post-crisis period would have boosted aggregate demand and smoothed out consumption patterns. Moreover, the UN report clearly shows that, throughout the developed world, private investment did not grow as one might have expected, given ultra-low interest rates. In 17 of the 20 largest developed economies, investment growth remained lower during the post-2008 period than in the years prior to the crisis; five experienced a decline in investment during 2010-2015. Globally, debt securities issued by non-financial corporations – which are supposed to undertake fixed investments – increased significantly during the same period. Consistent with other evidence, this implies that many non-financial corporations borrowed, taking advantage of the low interest rates. But, rather than investing, they used the borrowed money to buy back their own equities or purchase other financial assets. QE thus stimulated sharp increases in leverage, market capitalization, and financial-sector profitability. But, again, none of this was of much help to the real economy. Clearly, keeping interest rates at the near zero level does not necessarily lead to higher levels of credit or investment. When banks are given the freedom to choose, they choose riskless profit or even financial speculation over lending that would support the broader objective of economic growth. By contrast, when the World Bank or the International Monetary Fund lends cheap money to developing countries, it imposes conditions on what they can do with it. To have the desired effect, QE should have been accompanied not only by official efforts to restore impaired lending channels (especially those directed at small- and medium-size enterprises), but also by specific lending targets for banks. Instead of effectively encouraging banks not to lend, the Fed should have been penalizing banks for holding excess reserves. While ultra-low interest rates yielded few benefits for developed countries, they imposed significant costs on developing and emerging-market economies. An unintended, but not unexpected, consequence of monetary easing has been sharp increases in cross-border capital flows. Total capital inflows to developing countries increased from about $20 billion in 2008 to over $600 billion in 2010. At the time, many emerging markets had a hard time managing the sudden surge of capital flows. Very little of it went to fixed investment. In fact, investment growth in developing countries slowed significantly during the post crisis period. This year, developing countries, taken together, are expected to record their first net capital outflow – totaling $615 billion – since 2006. Neither monetary policy nor the financial sector is doing what it’s supposed to do. It appears that the flood of liquidity has disproportionately gone toward creating financial wealth and inflating asset bubbles, rather than strengthening the real economy. Despite sharp declines in equity prices worldwide, market capitalization as a share of world GDP remains high. The risk of another financial crisis cannot be ignored. There are other policies that hold out the promise of restoring sustainable and inclusive growth. These begin with rewriting the rules of the market economy to ensure greater equality, more long-term thinking, and reining in the financial market with effective regulation and appropriate incentive structures. But large increases in public investment in infrastructure, education, and technology will also be needed. These will have to be financed, at least in part, by the imposition of environmental taxes, including carbon taxes, and taxes on the monopoly and other rents that have become pervasive in the market economy – and contribute enormously to inequality and slow growth. The views expressed here do not reflect the views of the United Nations or its member states. Most investors know what an emerging market is. Some might even be able to offer a pretty good definition of what puts the “emerge” into emerging markets. But ask about the Middle East, and no one really knows what it is. Out of sheer necessity, the name “Middle East” was invented at the start of the 20th century. The need for a name was anchored in a geographic puzzle: how to distinguish the region between the Near East and the Far East. Depending on whom you ask, credit for coining the term “Middle East” goes to either the American military or the British government. Either way, the area’s new identity was determined by outsiders. The term Near East originally referred to the Ottoman Empire, while the Far East meant East Asia. When the Ottoman Empire disintegrated, it was vital to find a new term for the area that is today Turkey. The name “middle east” was popularized in 1902 by US Naval strategist Alfred Thayer Mahan in an article he authored that ran in the National Review. It has since entered the global lexicon as a term that everyone knows yet few can quite define. Today, the region that stretches from the eastern Mediterranean to the Iran-Afghan border, and from Turkey south (to include the entire Arabian Peninsula) is what we know as the Middle East. The region, however, is far more complex than lines on a map that reveal a discrete geography. It can also be defined based on ethnic and religious bloodlines. In this Middle East, the Arab world stretches from Morocco to Iraq and excludes non-Arab Muslim countries like Turkey and Iran. If we think in terms of the Muslim world, this Middle East might stretch from Morocco to Afghanistan, south into Africa, and north into Central Asia and southeastern Europe. The Middle East is the Arab core of the Muslim world. But thinking about the Middle East as exclusively Arab doesn’t work. Doing so excludes Turkey and Iran, plus a very large Kurdish population spread across Iran, Iraq, Turkey, and Syria. As well, viewing it as exclusively Muslim is deeply flawed. It would mean focusing on just a small part of the Muslim world. It also overlooks the Jews, Christians, Druze, Yazidis, Zoroastrians, Bahai, and other religious groups in the region. The idea of the Middle East has become quite vague. In my view, it is tied together by this concept: The Middle East is where perhaps the world’s most complex war is raging, and Middle Eastern countries are those that are involved in this war, one way or another. The war may metastasize into neighboring regions, but this is its heart. The first map above shows some of the Middle East’s topography. The northern region is mountainous, while the southern area is generally lowlands. The south is mainly populated by Arabs, save for Israel. The higher elevations of Turkey and Iran are non-Arab. Typically, mountainous terrain is less populated than lowlands due to factors like ease of making a living. Not so in the Middle East… since much of the lowlands lack water and offer a rather inhospitable quality of life. Overall, the population is concentrated in the mountains of Iran, Iraq, and Turkey. Secondary concentrations are found on the eastern Mediterranean coast and the southwestern and southeastern Arabian Peninsula. Religious divisions are particularly important, notably the division between Sunnis and Shiites. Also note the intermingling of Christians and Jews. In our view, conflicts begin with geography, as communities strive for security within their geography. Some people achieve security in remote mountain valleys. Others, like the Israelis, are always insecure, caught on the lowlands without any natural barriers. But an understanding of these many religious factions is not enough, as religious diversity is complicated by an array of ethnic subgroups. The Kurds are largely Sunni Muslims. They are hostile to Arab Sunnis and Shiites. The Druze are neither Muslim nor Christian, but can find themselves allied with either. The Druze who live in Israel are allied with Israel. The complexity of ethnic groups is partly due to the nature of mountainous regions, but also to the policy of the Ottomans. The Ottomans dominated this region for centuries. But unlike Muslim and Christian conquerors, they didn't pursue religious uniformity through forced conversion as long as the populace pledged their allegiance to the Ottomans. Thus, when the Ottomans retreated after World War I, they left behind a chaotic jumble of ethnic groups tied to various religions. Each group had the strength to survive but lacked enough strength to conquer the others. The consequence is inherent instability. The previous two maps show why all attempted conquests have failed to some degree. The lowlands are mainly desert and relatively underpopulated, which means that aggression was limited to low-level conflicts. On the lowlands, it is relatively easy for conquerors to come and go, and transform the population to reflect their values along the way. The mountainous northern region has highly diversified cultures and religions, and the terrain renders it difficult to conquer completely. Aggressors may control the main roads and mountain passes, but going into every valley is impossible. Mountains give the advantage to the defender, and unless a region is strategically critical, the conquerors will opt to leave them alone. The outcome is that mountain regions around the world—like the Caucasus, Balkans, or Appalachians—tend to protect unique cultures from annihilation. And proximity to people who differ from you results in conflict. These conflicts are ancient and repeat themselves. Moments of peace in both the mountains and the lowlands only occurred when one of the mountain nations was militarily and economically victorious and spread its influence south into what is today the Arab world. The latest and most important from our point of view was the Ottoman Empire. The Ottoman Empire collapsed after World War I primarily due to a single weakness. While the European and Russian empires participated in the industrial revolution, the Ottomans did not. And World War I was an industrial war. The Ottomans could win battles, but their empire couldn’t survive the war. The subsequent fragmentation of the empire laid the groundwork for the emergence of the modern Middle East. After World War I, the victorious powers divided the spoils under the Sykes-Picot Agreement. But they did not simply divide the prize; the area was consolidated in a configuration that had never existed before. Compare the map of the Ottoman provinces with the map the Europeans imposed. There were far fewer entities. The Europeans believed in the European-style nation-state as devoutly as if it were a religion. They divided the region into five states: Iraq, Syria, Palestine, Transjordan, and Lebanon. It is important to understand how artificial these entities were. The French took the northwest portion and consolidated it into one large state, Syria. However, they had backed the Maronite Christians in a prior civil war and wanted them to have their own state. They did this by carving out the southwestern portion of Syria and lacking a name for it, named it after the major mountain there, Lebanon. The British had supported an Arab insurgency against the Ottomans in the Arabian Peninsula. When the Sauds defeated their rivals, the Rashidis, shortly after World War I, there were two major tribal confederations in the peninsula. One was led by the ascendant Sauds, and the other led by the Hashemites. The Sauds sought to reconquer them to establish their dominion over as much of the peninsula as possible. The British had a relationship with the Hashemite patriarch, Sharif Hussein, and they gave his elder son, Faisal I, the kingdom of Iraq. His younger son, Abdullah, was sent to Amman, a small town on the east bank of the Jordan River. Lacking a name for the region surrounding Amman, the British called it Transjordan and arbitrarily drew border lines in a desert few would live in. “Trans” was later dropped from the name, and it became simply Jordan. The British also promised the Jews a state on the other side of the Jordan—while promising the Arabs there would be no Jewish state. They tried to solve the problem by creating a Jewish state where there hadn’t been a state for almost 2,000 years and giving Jordan authority over the Palestinian-majority West Bank. The point is that there is nothing natural about any of the Middle Eastern borders. Some of the states were created on a more solid foundation than others, but they were all invented over the last century. In fact, Sunni, Shiite, Arab, Kurdish, Persian, and Turkic dynasties have been competing in the Middle East since the 10th century. Indeed, the forces that shaped the Arab-majority Middle East are all non-Arab. Israel, Turkey, Iran, and Saudi Arabia are the major powers that frame the region. Saudi Arabia, the one Arab state that arose out of Western rule over the Middle East, is the weakest of the four. The center of the frame—Iraq, Syria, and occasionally Lebanon—has collapsed. Iraq exists in theory only, as the Shia-dominated government is merely one faction among several. The same is true for Syria, where Bashar al-Assad is simply a warlord battling other factions. And no one wants to assert power south of the mountains. The Turks now are far more cautious than their Ottoman predecessors. The Iranians have significant influence in Iraq and Syria, but they lack the strength to impose their will or the appetite for a larger commitment. The Israelis see the Jordan River as the limit of their power and confine themselves to supporting the Hashemite kingdom of Jordan (as artificial a state as any) as their buffer. As for the Saudis, they also try to shape events, but given internal economic problems and vulnerability to the Islamic State, there is little that they can do. But the center of the Middle East can’t hold. External powers created an arbitrary framework, one that is fragile at best. The American invasion in 2003 dissolved the glue that bound Iraq together. But a state that required a dictator like Saddam Hussein to hold it together would have failed with or without invasion, as we have seen in Syria. Given economic conditions, the alternative to dictatorship is clan-based relations, which constantly fragment the Arab heart of the Middle East and can occasionally create an explosive situation. The non-Arab countries that surround this region meddle in the situation but are not willing to mount a massive intervention. In some instances, distant powers like Britain, France, and the US have been more interested in the stabilization of the region than its neighbors were. Or to be more exact, the neighbors had more at stake than the distant powers, which could cut their losses and leave when the need arose. In this context, the rise of the Islamic State in the Middle East’s Arab heartland was unexceptional—as was the emergence of a new invented state. Nothing new here, as almost all the states in this region were invented. IS is reshaping a shapeless area, and no one from outside will directly engage them. But IS is also limited by geography, by economics, and by the inherent weakness of its territory. It doesn’t grow stronger, and its enemies don’t either. The regional strategies boil down to the three non-Arab powers trying to avoid excessive involvement in the Arab region and Saudi Arabia trying to avoid being drawn into conflicts that are beyond its capability to manage. As for the current great global power, the United States, it at least recognizes that trying to craft nations and states out of this region is not going to work. We toiling workers can allow ourselves a wry smile. For most of the last eight years the owners of wealth and inflated assets have had things their own way, while the real economy has been left behind. The tables are finally turning. The world may look absolutely ghastly if your metric is the stock market, but it is much the same or slightly better if you are at the coal face. The MSCI index of world equities has fallen almost 20pc since its all-time high in May of 2015, implying a $14 trillion loss of paper wealth. Yet the world economy has carried on at more or less the same anemic pace, and the OECD's global leading indicators show no sign that it is suddenly rolling over now. World growth has been drearily stable for years, shuffling along at 3.4pc in 2012, 3.3pc in 2013, and 3.4pc in 2014, and 3.1pc in 2015. The International Monetary Fund expects 3.4pc this year. The latest "GDPNow" tracker from the Atlanta Federal Reserve suggests that US growth is running at 2.5pc in the first quarter, smack in line with a typical late-cycle expansion in a mature economy. So, at the risk of sticking my neck out a long way, let me suggest that the equity bloodbath this year is little more than noise in the particular set of circumstances facing us. Students of the 1930s and the Keynesian liquidity trap might even argue that it is positively good for the world economy to the extent that it reflects an erosion of the global savings glut – the ultimate cause of our Long Slump – and entails a shift in spending power back to ordinary people. Oil revenues of the OPEC cartel have crashed from a peak of $1.2 trillion to $400bn at today's Brent prices of $31 a barrel, amounting to an $800bn annual transfer to consumers in Europe, China, India, and even the US – still a net beneficiary of cheaper oil. Note that the Texas economy is so diversified that it has largely shrugged off the shale crunch in its own backyard. This transfer acts as a shot of global stimulus, akin to a tax cut. Saudi Arabia, the Gulf states, Algeria, and Nigeria – as well as non-OPEC producers like Azerbaijan – have not offset this gain to global spending power with commensurate cuts in their own budgets. They are running down their foreign assets and sovereign wealth funds to put off the pain of austerity, or to "smooth consumption" in the jargon. Saudi Arabia's net holdings of overseas securities fell by $23bn in the single month of December. Fitch Ratings expects Abu Dhabi to drain its fund (ADIA) by $27bn this year. The Norwegians began dipping into their $820bn fund in October. A clutch of distressed sellers are having to liquidate stocks, bonds, and property for month after month on a grand scale. This is the exact reversal of what happened during the commodity boom when they siphoned off their surpluses – thereby depriving the world economy of aggregate demand – and pumped up global asset prices. This is a stock market rout we should celebrate. The money is rotating out of the markets and into our pockets. Americans have hardly begun to spend their bonanza. They have let it pile up in bank accounts, pushing up the US household savings rate from 4.5pc to 5.5pc in fifteen months, much to the surprise of the Fed. Sooner or later they will spend it, unless you think America has undergone a Puritan conversion. This stimulus has been obscured by the immediate and highly concentrated shock from the energy crash. The International Energy Agency says oil and gas companies slashed investment by $140bn last year. This has been painful, but it is a diminishing effect in macro-economic terms. And no, the oil price slump does not itself send any useful signal about the health of the global economy. The price slide is almost entirely the result of over-supply, greatly compounded by OPEC's political decision to flood the market to flush out rivals, and to slow the onrush of renewables. It is a textbook "positive supply shock", worth 2pc of world GDP. So let us take a cool view of these deranged markets, unflustered so long as the sell-off does not escalate into a crash, or seriously pollute the credit transmission mechanism of global finance. The wild card remains the volume of capital flight from China, and what that money is being used for. The People's Bank (PBOC) has run through $300bn of foreign reserves over the last three months. At this pace it is just four months away from the safe floor of $2.8 trillion under the IMF's adequacy metric for a country with a pegged exchange rate. If the outflows are largely to pay off dollar bank loans and "carry trade" positions – a wise precaution as the Fed drains dollar liquidity – they are harmless and will burn themselves out before long. The Bank for International Settlements says the dollar liabilities of Chinese companies peaked at $1.1 trillion in late 2014. They fell to $877bn in September – the most recent data – and may be nearer $500bn by now. The picture is much more dangerous if we are instead dealing with capital flight in tooth and claw, a collapse of confidence in the ruling party itself. Such a dramatic turn of events would overwhelm the PBOC's exchange rate defences and trigger a currency earthquake. I marvel at the cavalier way some analysts shrug off the risk of a drastic devaluation forced upon China by market forces. The Chinese spent $5 trillion on fixed capital investment last year, as much as North America and Europe combined. There is so much spare capacity in Chinese industry that a 15pc fall in the yuan – as some suggest – would send a deflationary tidal wave across a world already on the cusp of deflation. We would not then be talking about a global recession; we would be staring straight into the face of a depression. The overwhelming odds are that no such calamity is about to happen. China is a police state with extreme coercive powers and all kinds of ways to tighten capital controls, openly acknowledged or otherwise. The Chinese economy is picking up again, a fact that would now be obvious if the authorities had not manipulated their GDP data and put so much lipstick on the pig a year ago. Proxy indicators such as freight traffic show that the Chinese economy hit a brick wall in the first half of 2015 due to a fiscal and monetary shock. It has been recovering in fits and starts ever since. Fiscal spending rose at a 30pc rate in the final months of last year. Broad credit growth has jumped to 14pc. The money supply is on fire. Borrowing rates are falling. The Communist authorities are back to their bad old ways of stimulus as usual. This stores up even more trouble for 2017 or beyond, but it unquestionably puts off the day of reckoning for now. The backdrop to the current worldwide angst has been fifteen months of monetary tightening by the Fed, first by tapering bond purchases and then with the first rate rise in December. The combined effect has in one sense been equal to a full tightening cycle of 325 basis points – or thirteen rate hikes – according to work by the Atlanta Fed. The shock has been doubly potent in a world more "dollarized" than ever before, with offshore dollar debts up fivefold since 2000 to $9.8 trillion, and with global debt ratios 36 percentage points of GDP higher than before the Lehman Brothers crisis. Fed chief Janet Yellen took a huge risk raising rates at a time when spreads on US high-yield debt were flashing red, manufacturing was in recession, and US nominal GDP had been trending down for eighteen months. It was especially risky given that the Fed model appeared to relying on a Phillips Curve concept of the labour market – little changed from the 1970s – when the historical evidence tells us that jobs data are a lagging indicator, and notoriously fickle at an inflexion point. Michael Darda from MKM Partners compares the global effects to Fed tightening in the 1930s under the Gold Standard. It has transmitted a contractionary impulse worldwide, this time informally through dollar hegemony. The Fed was clearly caught off guard by the effects of its handiwork, just as it was after the Taper Tantrum in 2013, repeatedly failing to adjust its "closed-economy" model to the realities of the modern world. Mrs Yellen was wise to back off a little in her testimony to Congress on Wednesday, and we can now hope that the worst of this storm has passed. The ferocious dollar squeeze is at last ebbing. The currency has dropped 4pc since early December on the DXY index, and has even cooled a little against the Brazilian real, the Turkish lira, and other recent casualties. This is the reprieve that half the world has been praying for. We now have a little wind in our sails. The oil dividend is coming through, and with luck China is over the worst. So cover your ears and shut out the market noise. Spoiler alert. I am about to give away the ending to the classic Agatha Christie whodunnit thriller, Murder on the Orient Express. There are 12 suspects and it turns out all of them took turns to stick the dagger into the victim. In the midst of the worst global market sell-off since the great financial crisis of 2008, at least 12 suspects are being named. The most worrying thing of all is that they all had a hand in the sell-off. The refusal to limit supply allowed oil prices to keep charging down, to levels that almost nobody had planned for. Yes, that is a boon for consumers and for any country that imports oil. But the short-term impact on everyone else, and particularly on the US economy, which has come to rely on the energy industry for its growth, was horrendous. SWFs were built up largely with the wealth generated from petrodollars. Oil price declines may well have obliged many to start selling. They would generally start selling their most liquid investment, that showed a profit, like Japanese or US stocks. In Japan, SWF fire sales have been openly blamed for the sell-off. The sudden fall in Chinese A-shares, after a bubble, ignited concern last year; the fact that the authorities tried to arrest the fall, and failed, turned concern into alarm. Any indicator of ill health in China is still reason for concern — so resumed pain for A-shares this year damaged everyone. Yes, China can rightly argue that its crude devaluations against the dollar last August and again last month were merely to maintain stability against a range of trading partners. But the speed with which reserves are being used, and the apparent eagerness of the Chinese to move their money out of the country, is generating real alarm. A forced Chinese devaluation would be a game-changer. This one’s easy. From 2009, stock market gains had tracked the swelling of the Fed’s balance sheet. Everyone was terrified of what would happen when the Fed finally raised. When it did so, it tarried too long, and started to raise rates just as employment gains were petering out and an inventory build-up suggested that the cycle in the US was nearing an end. Once the Fed hiked, in December, risk assets the world over revolted. The news on corporate America’s profitability has been lost in the noise of the last few weeks. It would not have been if the results had been any good. But they were terrible. At last count, Thomson Reuters held that the S&P 500 companies were on course for a fall of 4.1 per cent for the fourth quarter of last year. Following gloomy forecasts from companies themselves, the current quarter is expected to be just as bad, while estimates for the year are being slashed. Negative rates from Japan, following the European Central Bank and then followed by Sweden’s Riksbank, were meant to show anti-deflationary zeal. Instead, the message was that central banks were prepared to wound the profits of banks, even though they had never been properly recapitalised after the crisis, especially in Europe. A rout in bank stocks ensued. That in turn convinced many that central banks were therefore out of ammunition — if negative rates cannot work, what else can they do? When the year started, much of this bad news was in the price — but the conventional wisdom was that the US economy was nowhere near a recession, and this would limit any “downside” falls. The data since then has been anaemic, challenging this assertion. Most particularly the bond market is sending a classic recession signal, through a flattening of the yield curve — long-dated bonds now command a much lower extra yield over short-dated bonds than they used to, in what has historically been possibly the most reliable indicator of a recession to come. This has added to the alarm. A key argument for US bulls has been that the long rally since 2009 was always “hated” — few ever trusted it. That implied there was further to go before a true market top. But reliable long-term valuation metrics suggested that the US was hugely overvalued and in the grip of irrational exuberance. Once the market turned it was obvious that few saw anything compellingly cheap and so nobody wanted to buy. (This argument does not, however, apply to Europe or the emerging markets, which entered the last few months looking unambiguously cheap). A popular one. Re-regulation since the crisis has successfully dissuaded large banks from betting with depositors’ money by making markets in bonds and credit. That makes the banks less risky, but deprives those markets of liquidity, meaning that when selling starts, buyers can be hard to find — and volatility and scary falls ensue. Voters are scaring the poor investors. Whether it is the threat to install a socialist (Bernie Sanders), or a devotee of the gold standard (Ted Cruz), or Donald Trump as president in the US, or the threat to take the UK out of the EU, or the myriad populist movements within the EU, the sense that the population has had enough intensifies. This is highly understandable. It is not reassuring for capital markets. Oddly, nobody this time around is trying to blame short sellers. There are some short sellers somewhere and they are presumably doing well. But unlike in 2008, or during the Great Crash, nobody is trying to blame them for bringing anyone down. Also, note that I got through the list without mentioning the words “Syria” — arguably the world’s greatest humanitarian and geopolitical crisis in decades — or “Greece”, which six months ago terrified everyone. Greece’s stock market is the world’s worst performing for the year and the eurozone’s Greek issue has not gone away. But the tragic situation in these countries has had nothing to do with the alarm that has gripped world markets in the last six months. And most intriguing is another suspect who has gone largely unmentioned. To move to another classic English detection novel, it is like Sherlock Holmes’ dog that did not bark. Nobody is yet blaming governments or their failure to use taxpayers’ money to address the problems. It is the lack of any attempt at active fiscal policy — in the US, UK, Germany or Japan — that has forced central banks to enter the gap. Now monetary policy seems to have lost efficacy, maybe it is time for politicians to agree on measures like recapitalising European banks, or rebuilding US infrastructure. As incumbent governments tend to get booted out after people have lost money on the market, politicians need to think about this quick. Or the daggers will be out for them. IF THE start of the year has been desperate for the world’s stockmarkets, it has been downright disastrous for shares in banks. Financial stocks are down by 19% in America. The declines have been even steeper elsewhere. 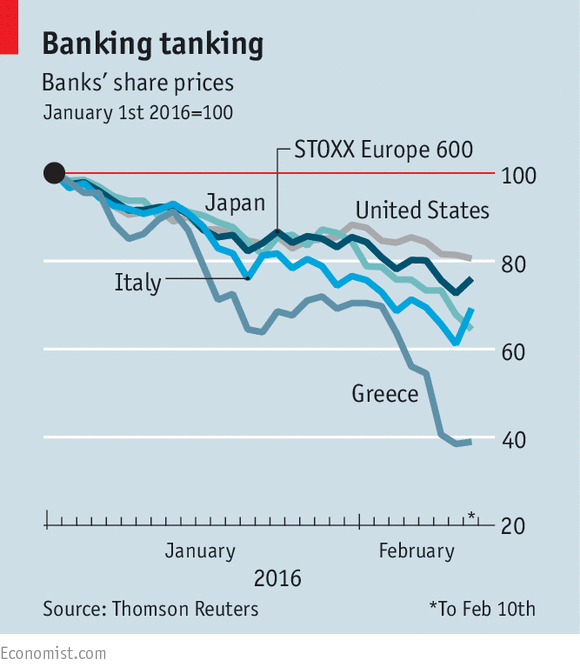 Japanese banks’ shares have plunged by 36% since January 1st; Italian banks’ by 31% and Greek banks’ by a horrifying 60% (see chart). The fall in the overall European banking index of 24% has brought it close to the lows it plumbed in the summer of 2012, when the euro zone seemed on the verge of disintegration until Mario Draghi, the president of the European Central Bank (ECB), promised to do “whatever it takes” to save it. The distress in Europe encompasses big banks as well as smaller ones. It has affected behemoths within the euro area such as Société Générale and Deutsche Bank (see article)—both of which saw their shares fall by 10% in hours this week—as well as giants outside it such as Barclays (based in Britain) and Credit Suisse (Switzerland). The apparent frailty of European banks is especially disappointing given the efforts made in recent years to make them more robust, both through capital-raising and tougher regulation. Euro-zone banks issued over €250 billion ($280 billion) of new equity between 2007, when the global financial crisis began, and 2014, when the ECB took charge of supervising them. Before taking on the job, it combed through the books of 130 of the euro zone’s most important banks and found only modest shortfalls in capital. Some of the recent weakness in European banking shares arises from wider worries about the world economy that have also driven down financial stocks elsewhere. A slowdown in global growth is one threat. Another is that the negative interest rates being pursued by central banks to try to prod more life into economies will further sap banks’ profits. A retreat in Japanese bank shares turned into a rout following such a decision in late January. Investors in European banks fret not just about lacklustre growth but also a possible move deeper into negative territory by the ECB in March. On February 11th Sweden’s central bank cut its benchmark rate from -0.35% to -0.5%, prompting shares in Swedish banks to tumble. But the malaise of European banking stocks has deeper roots. The fundamental problem is both that there are too many banks in Europe and that many are not profitable enough because they have clung to flawed business models. European investment banks lack the deep domestic capital markets that give their American competitors an edge. Deutsche, for instance, has only just resolved to hack back its investment bank in the face of a less hospitable regulatory environment following the financial crisis. And there are still too many poorly performing smaller banks within national markets. Although this year’s share-price declines have been steepest in Greece, these largely reflect renewed political tensions over implementing the country’s third bail-out. The banks arousing fresh concern are those in Italy, whose troubles go beyond an excess of them. One specific worry is the dire state of the country’s third-biggest (and the world’s oldest) bank, Monte dei Paschi di Siena, which has long been in intensive care and whose share price has fallen by 56% this year. Its woes reflect poor governance, a problem that plagues Italian banks, many of which are part-owned by local, politically connected foundations. A more general worry is that Italy’s banking sector as a whole is weighed down with bad loans which have built up during recent years. Although Italian GDP has been expanding since the start of 2015, it is still around 9% lower than its pre-crisis peak in early 2008. This has hurt Italian firms—and their pain has been transferred to the banks that lent to them. Gross non-performing loans amount to €360 billion (18% of the total), of which €200 billion are especially troubled. There is nothing new about Italy’s high level of non-performing loans; if the recovery can be sustained they should eventually start to come down. Moreover, over half of the sourest loans are covered by provisions, which means that the potential bill is more manageable, at around €90 billion rather than €200 billion. What has changed this year is a new European approach to tackling troubled banks, which shifts the burden for bail-outs from taxpayers to creditors who are “bailed in” when big losses arise. These rules, which have come fully into force this year (a few countries applied them in 2015), mean that senior bondholders and depositors with balances above €100,000 can be stung when banks are resolved. Bank bonds are generally held by institutional investors who can look after themselves, but in Italy around €200 billion are in the hands of retail customers who were lured to invest in them until 2011 by favourable tax treatment. These retail bonds would be vulnerable if banks run short of capital after big write-downs. This danger was highlighted late last year when four small banks were rescued in a rush to avoid this year’s more stringent bail-in provisions. That process ensnared retail bondholders holding junior debt, who could already be bailed in under the previous rules. One committed suicide. The furore has unnerved Italians. Ignazio Visco, governor of the central bank, has said that a less abrupt transition to the new bail-in regime would have been better. The strict rules have also curtailed the ability of the Italian government, led by Matteo Renzi, to calm nerves by excising the bad loans from the banking system. Instead of setting up a state-backed “bad bank” to remove them, Mr Renzi has had to adopt a feebler approach in which the government will guarantee the senior tranches of securitised bundles of the bad loans. Investors plainly doubt this scheme will help much, to judge by the performance of Italian bank shares. Frustration with European constraints on Italy’s attempt to sort out its banks is one reason why Mr Renzi has been making barbed attacks on the German way of running the euro area. Such political tension is adding to jitters about Italian banks. Portuguese banking shares have also tumbled, in part because a new left-of-centre coalition government alarmed international investors by its decision to impose heavy losses on some senior bank bonds late last year. In seeking to transfer the risk of failing banks away from taxpayers to creditors, European policymakers may have thought they were depoliticising the banks. In the euro-zone periphery, however, politics is never peripheral. Evo Morales denies running a narco state. Mounting evidence suggests otherwise. A Boko Haram massacre in a northeastern Nigerian village last month captured world-wide attention as it was reported that the terrorists burned children alive. Far less reported are credible allegations that a key source of funding for Boko Haram and other Islamic extremists is cocaine, produced and exported by the Revolutionary Armed Forces of Colombia (FARC) and other drug-smuggling cartels working in concert with the Bolivian government. This is the same FARC supposedly negotiating a peace agreement with Colombian President Juan Manuel Santos—an agreement that would derail its drug-trade gravy train. Europe’s recreational drug users like cocaine. European and U.K. drug warriors thought they could curb the availability of the white powder by cracking down on South American supply lines. But the cocaine capos have shifted their trans-Atlantic routes to Africa, where weak institutions are no match for transnational organized crime. Numerous press reports have named both Boko Haram and al Qaeda in the Maghreb as key players in the business of smuggling coke across the Mediterranean into Europe. 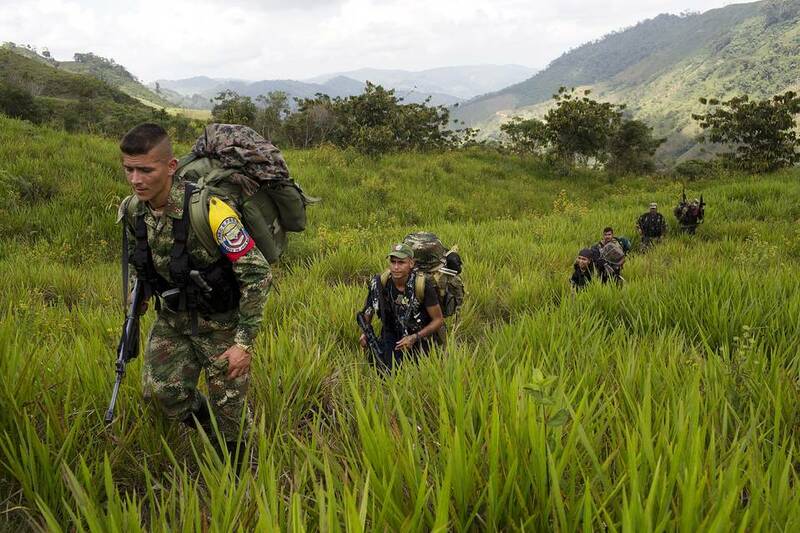 The State Department’s Bureau of International Narcotics and Law Enforcement noted in November that Colombia is once again the world’s largest exporter of cocaine. But Bolivia may be the more profitable place for cartels like FARC to operate. That’s suggested by a January 2014 paper by David Spencer, a professor of counterterrorism at the William J. Perry Center at Fort McNair, and Hugo Achá Melgar, a Bolivian journalist who now lives in the U.S. It traces the rise to power of Bolivian President Evo Morales, a former union leader of the country’s coca-growers, or cocaleros. The paper, which has not yet been published but which I read, tells of how Washington’s coca-eradication agenda was used by Bolivia’s hard left to launch and build the cocalero political movement beginning in the mid-1990s. Mass protests that paralyzed the country were made possible by a mix of underworld wealth and violence. The cocaleros brought down two democratically elected governments in October 2003 and June 2005, and then won the subsequent election in December 2005. Mr. Morales denies that he runs a narco state. And since he banished the U.S. Drug Enforcement Agency from the country in 2008, U.S. intelligence is limited. Yet mounting evidence suggests that cocaine trafficked to Islamic terrorists is now a major source of Bolivia’s export income. In 2006, when Mr. Morales first took office, the White House Office on National Drug Control Policy estimated coca cultivation in Bolivia at 21,500 hectares. By 2014 its estimate jumped to 35,000—not surprising, as Mr. Morales legalized coca growing on grounds that it is central to Bolivian cultural heritage and used for chewing and tea. Yet the largest expansion of coca cultivation has been in the Chapare region, which produces a variety unsuitable for chewing. And in “The Republic of Cocaine,” a 2012 article in the Brazilian magazine Veja, journalist Duda Teixeira reported that only one-third of the Bolivian coca crop goes to traditional uses. The total area planted with coca in Colombia is greater than in Bolivia. But the soil in the Chapare supports a coca variety with a larger leaf that is replenished faster and has a higher content of the active ingredient needed to produce cocaine than what is grown in Colombia. Mr. Morales’s critics contend that numerous cartels—including Mexican, Brazilian, Colombian and African players—have won concessions from him that allow them to access this crop, set up laboratories to process the leaves, and export the product. Roger Pinto Molina was a Bolivian senator in 2010 when members of the police and Morales government insiders brought him documents that he says proved that two members of the president’s cabinet had ties to Colombian and Brazilian cartels. In his Veja article, Mr. Teixeira wrote that he had viewed documents, including a report by an intelligence unit of the Bolivian police, linking at least one cabinet member to the cartels. The Bolivian government has denied the allegation in Mr. Teixeira’s article. Mr. Pinto told me by telephone last week that he brought the evidence to Mr. Morales—and that shortly thereafter the government opened investigations of the senator. He fled to the Brazilian Embassy, where he remained for two years until he managed to escape the country. Prior to 2006 Bolivian-flagged ships did not operate in conflict zones in the Mediterranean. Under Mr. Morales that’s changed. In September Greece nabbed one that was loaded with 500,000 rounds of ammunition and 5,000 rifles and bound for a Libyan port. In January Turkey seized another off the coast of Libya carrying 13 tons of hashish. None of this is likely to matter to Mr. Morales’s political career. On Feb. 21 he will hold a referendum on whether he should be entitled to be re-elected twice more. With the country seemingly awash in laundered drug money, the contest is his for the taking. 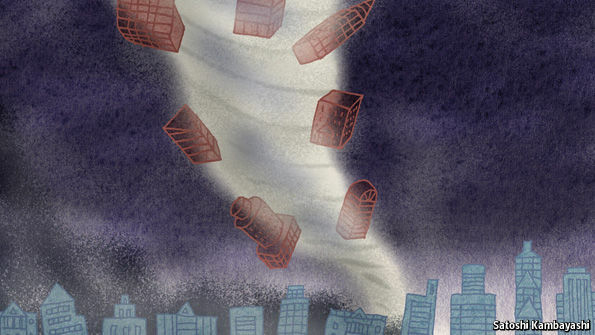 Financial markets the world over are increasingly chaotic; either retreating or plunging. Our view remains that there's a gigantic market crash in the coming future -- one that has possibly started now. Our reason for expecting a market crash is simple: Bubbles always burst. Bubbles arise when asset prices inflate above what underlying incomes can sustain. Centuries ago, the Dutch woke up one morning and discovered that tulips were simply just flowers after all. But today, the public has yet to wake up to the mathematical reality that over $200 trillion in debt and perhaps another $500 trillion of un(der)funded liabilities really cannot ever be paid back under current terms. However, this fact is dawning within the minds of more and more critical thinkers with each passing day. In order for these obligations to be reset to a reality-based level, something has to give. The central banks have tried to modify the phrase "under current terms" by debasing the currency these obligations are written in via inflation. Try as they have, though, they've been unable to create the sort of "goldilocks" low-level inflation that would slowly sublimate that massive pile of debt into something more manageable. Wide-spread inflation has not happened. Why not? Because they've failed to note that plan of handing all of their newly printed money to a very wealthy elite -- while a socially popular thing to do among the cocktail party set -- simply has concentrated the inflation to the sorts of assets the monied set buys: private jets, penthouse apartments, fine art, large gemstones, etc. So yes, their efforts produced price inflation; just of the wrong sort. Even worse, all the central banks have really accomplished is to assure that when the deflation monster finally arrives it will be gigantic, highly damaging and possibly uncontrollable. I'll admit to being worried about this next crash/crisis because I imagine it will involve record-setting losses, human misery due to lost jobs and dashed dreams, and possibly even the prospect of wars and serious social unrest. Let me be blunt: this next crash will be far worse and more dramatic than any that has come before. Literally, the world has never seen anything like the situation we collectively find ourselves in today. The so-called Great Depression happened for purely monetary reasons. Before, during and after the Great Depression, abundant resources, spare capacity and willing workers existed in sufficient quantities to get things moving along smartly again once the financial system had been reset. This time there's something different in the story line: the absence of abundant and high-net energy oil. Many of you might be thinking "Hey, the price of oil is low!" which is true, but only momentarily. Remember that price is not the same thing as net energy, which is what's left over after you expend energy to get a fossil fuel like oil out of the ground. As soon as the world economy tries to grow rapidly again, we'll discover that oil will quickly go through two to possibly three complete doublings in price due to supply issues. And those oil price spikes will collide into that tower of outstanding debt, making the economic growth required to inflate them away a lot more expensive (both cost-wise and energetically) to come by. With every passing moment, the world has slightly less high-net energy conventional oil and is replacing that with low-net energy oil. Consider how we're producing less barrels of production in the North Sea while coaxing more out of the tar sands. From a volume or a price standpoint right now, the casual observer would notice nothing. But it takes a lot more energy to get a barrel of oil from tar sands. So there's less net energy which can be used to grow the world economy after that substitution. Purely from a price standpoint, our model at Peak Prosperity includes the idea that there's a price of oil that's too high for the economy to sustain (the ceiling) and a price that's too low for the oil companies to remain financially solvent (the floor). That ceiling and that floor are drawing ever closer. When we reach the point at which there's not enough of a gap between them to sustainably power the growth our economy currently is depending on, there's nothing left but to adjust our economic hopes and dreams to more realistic -- and far lower -- levels. When this happens most folks will undergo a "forced simplification" of their lifestyles (as well as their financial portfolios), which they will experience as disruptive and emotionally difficult. Our diagnosis of the fatal flaw facing the global economy and its financial systems has remained unchanged since before 2008. We can sum it up with these three simple words: Too much debt. All but the most blinkered can rapidly work out the fallacy captured in the above chart. Sooner or later, borrowing at a faster rate than income growth was going to end because it has to. Again, it's just math. Math that our central planners seem blind to, by the way -- all of whom embrace "More debt!" as a solution, not a problem. The chart's global debt number is only larger now, somewhere well north of $200 trillion here in Q1 2016. But consider, if you will, that entire world had 'only' managed to accumulate $87 trillion in total debt by 2000 (this is just debt, mind you, it does not include the larger amount of unfunded liabilities). Yet governments then managed to pour on an additional $57 trillion just between the end of 2007 and the half way point of 2014, just seven and half short years later. Was this a good idea? Or monumental stupidity? We're about to find out. My vote is on stupidity. In just the first few weeks of 2016, the prices of many bank stocks have suddenly dropped to deeply distressed territory. And the price of insurance against default on the bonds of those banks is now spiking. While we don't know exactly what ails these banks -- and, if history is any guide, we probably won't find out until after this next crisis is well underway -- but we can tell from the outside looking in that something is very wrong. DoubleLine Capital's Jeffrey Gundlach said it's "frightening" to see major financial stocks trading at prices below their financial crisis levels. He cited Deutsche Bank AG and Credit Suisse Group AG as examples in a talk outlining bearish views at a conference in Beverly Hills, California, on Friday. Both banks fell this week to their lowest levels since the early 1990s in European trading. "We see the price of major financial stocks, particularly in Europe, which are truly frightening," Gundlach said. "Do you know that Credit Suisse, which is a powerhouse bank, their stock price is lower than it was in the depths of the financial crisis in 2009? Do you know that Deutsche Bank is at a lower price today than it was in 2009 when we were talking about the potential implosion of the entire global banking system?" This time it looks like the trouble is likely to begin in Europe, where we've been tracking the woes of Deutsche Bank (DB) for a while. But in Italy, banks are carrying 18% non-performing loans and an additional double digit percentage of 'marginally performing' or impaired loans. Taken together, these loans represent more than 20% of Italy's GDP, which is hugely problematic. The Italian banking sector may have upwards of 25% to 30% bad or impaired loans on the books. That means the entire banking sector is kaput. Finis. Insolvent and ready for the restructuring vultures to take over. On average, in a fractional reserve banking system operating at a 10% reserve ratio, when a bank's bad loans approach its reserve ratio, it's pretty much toast. By 15% that's pretty much a certainty. By 20% you just need to figure out which resolution specialist to call. At 25% or 30%, you probably should pack a bag and skip town in the dead of night. Those are pretty hefty losses over a short period of time, and that's meaningful. While the headline equity indexes are managing to keep their losses minimized, these bellwether stocks from the critical finance sector are stampeding out the back door. And when I say 'critical', I mean in the sense that a hefty amount of the overall earnings within the S&P 500 and other major stock indexes were fraudulent profits were derived from the banks feeding on central bank thin-air money and front-running central bank policy. What's there to worry about? Well, just pick something. It could be a combination of headwinds conspiring to drag down bank earnings from here. Take your pick: reduced trading and M&A revenue, and lower profits from ridiculously flat yield curves and negative interest rates. However, we have to include the possibility that No more bailouts are coming. Why not? Mainly because it would be politically incendiary at this moment to even try such a thing. Public resentment of the banks is high all over the world, and in the US specifically, there's an election primary that is hinging for the Democrats on Wall Street coziness. Maybe the markets are pricing that in? Or it could be that these banks have been playing with fire (again) and got burned (again). We know for sure that a number hold a boatload of junk debt from the energy sector that will need to be written off. And we suspect many are staring at losses from writing too many derivative contracts that have turned against them. If only the greatest near-term risks were limited to the bad actions of the banks. But that's sadly not the case. The collapse in the price of oil has been vicious, but it's likely not done. The oil patch has morphed into a capital-destruction zone for many drillers and as we have been warning all last year, the fallout is going to be worse than we can imagine. And it's just getting underway.